I had an awful night’s sleep, only managing about three hours and I’ve been blaming the steroids. The Accountant wryly commented that I must be getting some practise for what life is about to come. No thank you. Let me tell you. You do not need to practise sleep deprivation. I know it will come, and there is no amount of preparation that will make it easier, so in the meantime, I would like maximum sleep possible. The end. I headed back to the hospital for the second dose of steroids. I need to get them from the labour ward. Yesterday when I went in there, all was quiet as no one was in labour. Today, with two women labouring, it was not so quiet. I have been feeling mildly anxious about having a Caesar, it’s a bit of an unknown for me. 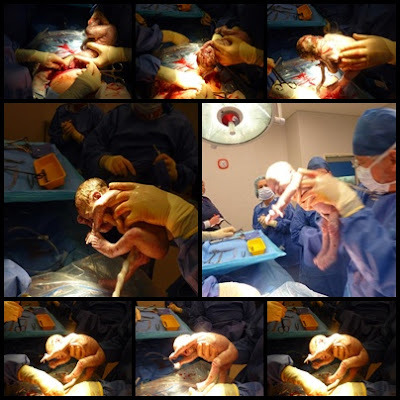 I tell you, as I listened to the crying, and groaning and all other noises associated with childbirth, a wave of relief swept over me that at least I will not have to endure that experience again. Mind you, I’m still not keen on the recovery process after a Caesar, but you’ve got to look at the silver lining sometimes. Felt awful over the weekend, constantly fighting headaches and bouts of nausea. With The Accountant at home taking care of the boys, I spent most of the time lying down, but for some reason could never lie in the same place for more than an hour or so. I kept switching between various lounge chairs and the bed. I had been getting stomach cramps, which were steadily getting worse, by the early hours of Monday morning, I was concerned that it could be contractions, even though it did feel more like a tummy bug. I rang the doctor up and went in and saw him Monday morning, just to be on the safe side. I’ve read too many stories of triplet pregnancies where the mother hadn’t realised that contractions were beginning, and labour could have been halted if they had picked up on some warning signals. After Dr. G took my blood pressure, and had a good poke around my stomach, the babies were declared safe and I was instructed to continue with lots of rest. So it appeared that it was just a case of flu and gastro. Oh, and it seems that blaming the steroids was unjust as Dr. G said that nausea is certainly not a side effect from that particular drug. I continued to have some improvement, but all week have been feeling a bit yuck, although it comes in waves, and sometimes I’ll feel fine, and next thing a wave of sickness will hit. 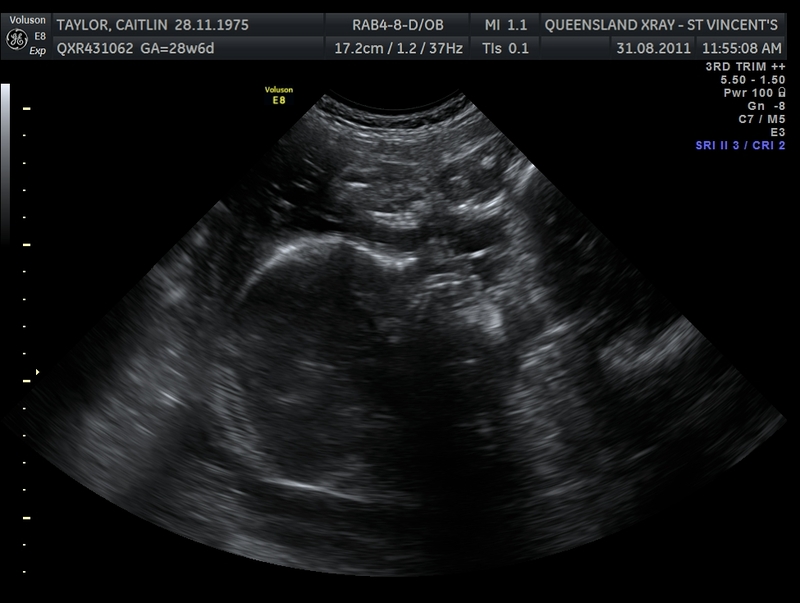 Ended the week with an ultrasound to check the triplet’s growth. Once again they have been re-named. This is how they have been labelled thus far. propriate weight range. It’s just that I know they will be earlier than a normal baby, so I would prefer it if they were a bit bigger rather than smaller. Absolutely nothing to worry about though. It is getting harder to clearly see what is what during the scan now. 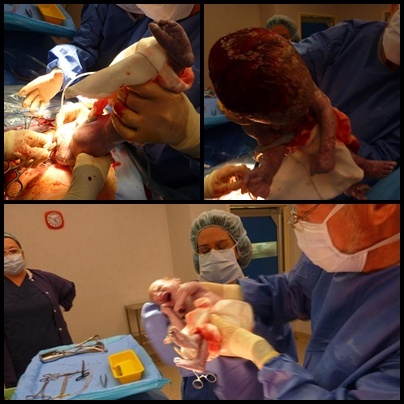 The pictures are quite blurry and often the babies are hard to see since there is normally someone else’s body parts in the way. 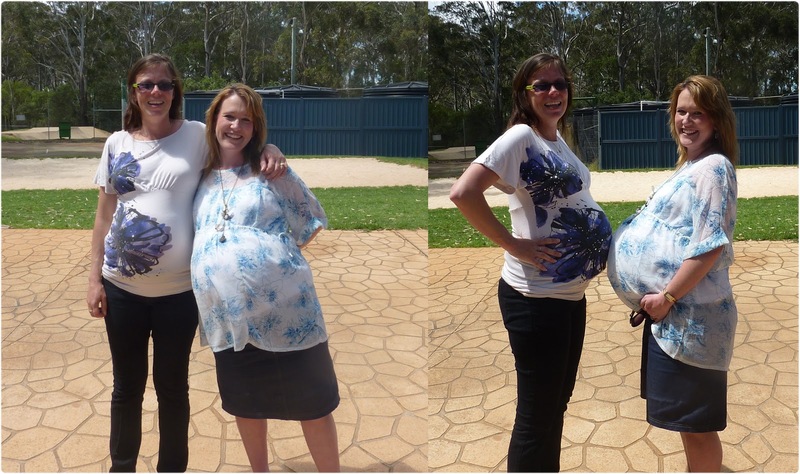 We only really got one good picture on the day, would you believe of elusive Triplet 2/B? I had told the sonographer that I didn’t have any good photos of this one, so she considered it her personal mission to obtain one. I classify it as the shroud of Turin shot. Most people have to really look to distinguish that there is a face there. 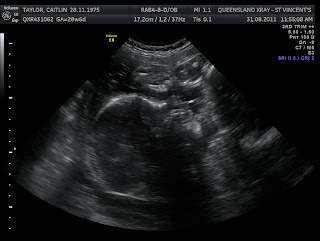 T2 is looking straight through my tummy at the camera, but the face is rather squashed against the stomach wall, so it makes it a bit more difficult to distinguish. 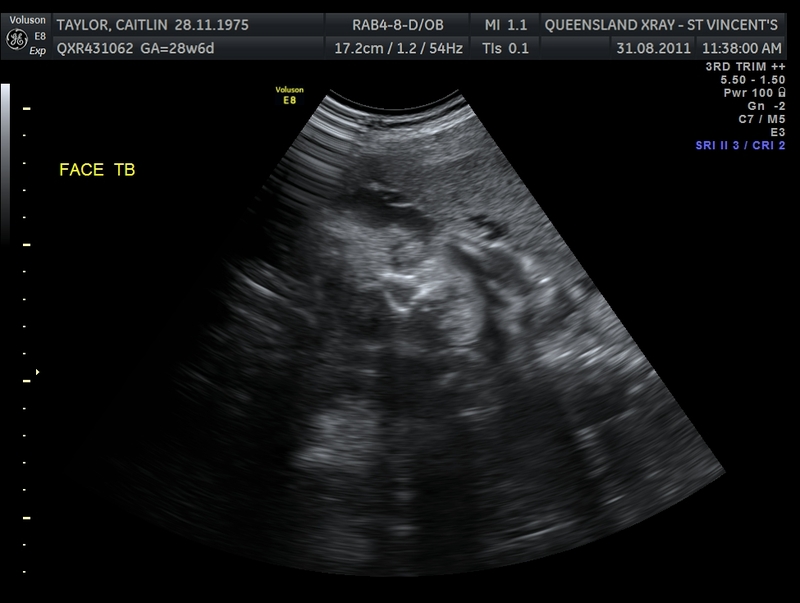 The thing that excited and impressed me most during the scan was discovering that Triplet C (Fraternal) has lots of hair! I had no idea that you could find that out during an ultrasound! It seems that A & B have very little hair. My two older boys both had lots of hair, which is a trait inherited from their father’s side of the family. All the babies in my family were baldy. Considering how much J Boy and Toddler T look like their Daddy, this has quietly given me hope that maybe I will have two of my five children that display some of my genetic traits. Just to prove that the pictures aren’t crash hot, here’s the second best image of the day. This time of Fraternal Triplet. Don’t you just love all that mass of hair? 😉 This is a profile of the head.